Ramón G. Cabanach, Universidad de A Coruña. Alfredo Ardila, Florida International University (Miami). 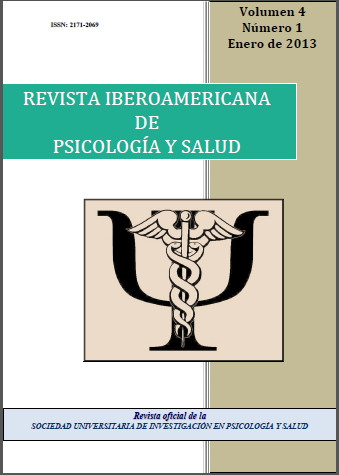 Coordinator of the Neuropsychology Area. Francisca Fariña, University of Vigo. Coordinator of the Intervention Area. Telmo Mourinho Baptista, University of Lisboa. Coordinator of the Psychology and Profession Area. Leandro Almeida, University of Minho (Portugal). Ariel Alonso, Maastricht University (Netherland). Constantino Arce, University of Santiago de Compostela (Spain). Rubén, Ardila, National University of Colombia (Colombia). Jorge L. Arias, University of Oviedo (Spain). Wayne A. Bardwell, UC San Diego Moores Cancer Center (USA). María Paz Bermúdez, University of Granada (Spain). Guillermo Bernal, University of Puerto Rico (Puerto Rico). José Luis Cantero, University Pablo de Olavide (Spain). Ángel Carracedo, University of Santiago de Compostela (Spain). Joaquín Caso, Autonomous University of Baja California (Mexico). Jorge A. Cervilla, University of Granada (Spain). Fernando Chacón, Complutense University of Madrid (Spain). María Corsi, National Autonomous University of Mexico (Mexico). Jose Ramón Fernández Hermida, Universidad de Oviedo (Spain). Oscar Goncalves, Northeastern University (USA). Julio A. González-Pienda, University of Oviedo (Spain). Joan Guárdia, University of Barcelona (Spain). Francisco Gude, Universitary Hospital of Santiago de Compostela (Spain). Laura Hernández, National Autonomous University of Mexico (Mexico). Silvia Helena Koller, Federal University of Rio Grande do Sul (Brazil). María Ángeles Luengo, University of Santiago de Compostela (Spain). Paulo Machado, University of Minho (Portugal). Katie Moraes de Almondes, Federal University of Rio Grande do Norte (Brazil). José Muñiz, University of Oviedo (Spain). Ricardo F. Muñoz, University of California (USA). Bertha Musi-Lechuga, Autponomous University of Ciudad Juárez (Mexico). Francisco Navarro, University of Málaga (Spain). Charles Negy, University of Central Florida (USA). Mercedes Novo, University of Santiago de Compostela (Spain). Jordi Obiols, Autonomous University of Barcelona (Spain). José Alonso Olivas, Autonomous University of Ciudad Juárez (Mexico). Wenceslao Peñate, University of La Laguna (Spain). Antonieta Pepe Nakamura, Univ.Uniftec (Brazil). Abilio Reig, University of Alicante (Spain). Francisco J. Rodríguez, University of Oviedo (Spain). Francisco Santolaya, President of the Spanish Psychological Association (Spain). Dolores Seijo, University of Santiago de Compostela (Spain). Juan Carlos Sierra, University of Granada (Spain). Antonio Valle, University of A Coruña (Spain). Pablo Vera, University of Santiago de Chile (Chile). Stefano Vinaccia, Santo Tomás University (Colombia). Javier Virues, University of Auckland (New Zealand).